Last summer I received a beautiful dessert magazine in the mail. 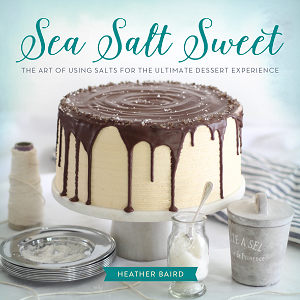 It was titled Sweet Dreams, and the cover had a big glossy image of a cake on it. It was so striking, I couldn't wait to read every single page. I quickly found out it was written in German, so reading would have to wait for translation. Still, I sat leafing through the pictures and -surprise- a picture of me! There I was, in the same magazine with esteemed pastry chefs and their gorgeous desserts -which was a real hoot, if you ask me! 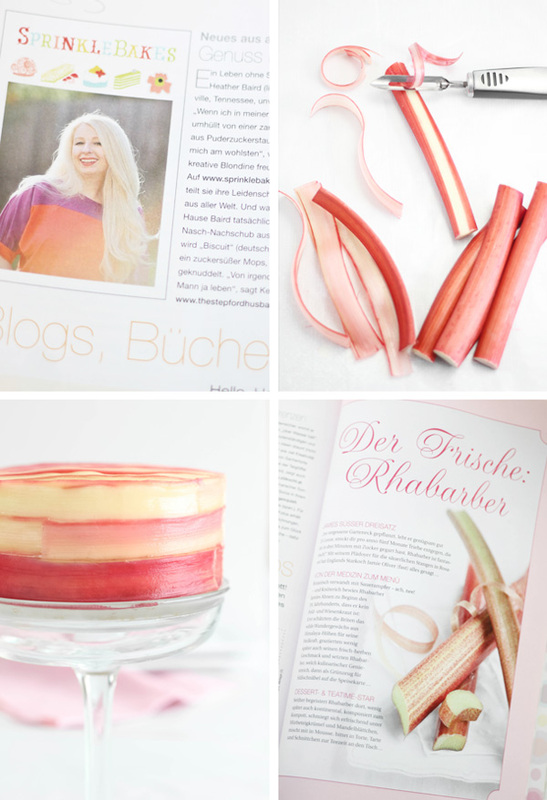 On the opposite page (and more eye-catching than I could ever be) was a picture of fresh rhubarb, with stalks shaved paper-thin and curled into ribbons. I may have gasped, it was so beautiful. 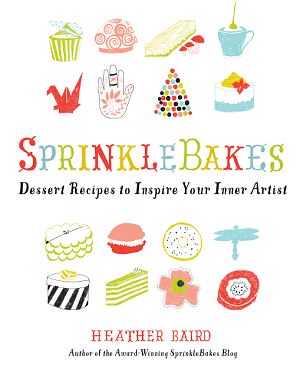 Further into my reading (if you can call it that) I fell in love with a cake. At first glance I had no idea what was on the inside, nor did I care because the outside was so stunning. It was all wrapped up in strips of pink-red rhubarb. I wanted to make it immediately, but found myself questioning my own aptitude. Then I remembered something a smart baker once said: you shouldn't be afraid of cake, if anything, cake should be afraid of you because you're going to eat it. I decided to go forward on that thought. Since the recipe was in German, I set to translating it, and gratefully I have a friend who is a German professor who helped me when I stumbled (dankeschön, Darlene!). After the recipe was translated in full, I decided to use my own method for making pineapple mousse, mostly because the recipe called for gelatin sheets, and those aren't sold in grocery stores here. Other problems persisted - the local produce wasn't great, I could only find short stalks of rhubarb and I couldn't find any good tarragon (only bad tarragon), so a few things were changed and simplified along the way. Despite all the tweaking, this cake is delicious. Dreamy. 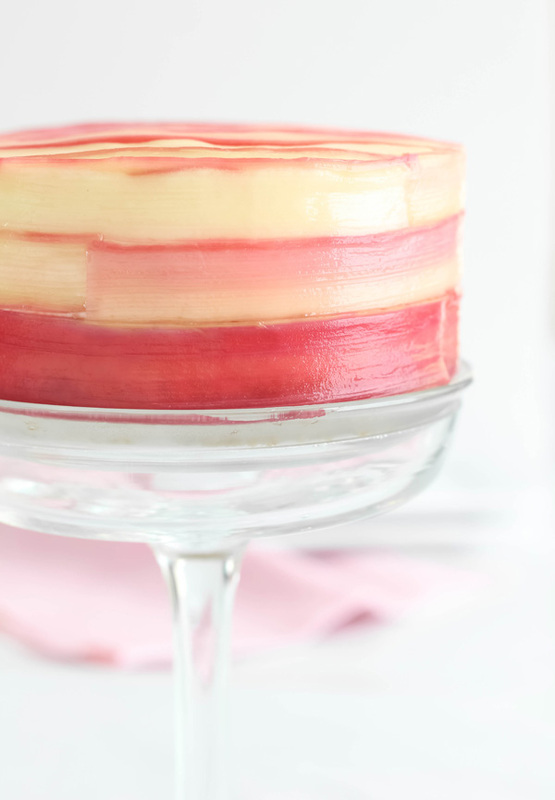 And, of course, the one thing I refused to compromise was the beautiful paper thin covering of rhubarb strips across the cake. This recipe makes a standard 8-inch cake. Since my rhubarb stalks were so very short, and they wouldn't have wrapped very far around a cake that size, I ended up making one 5-inch cake and three 2-inch cakes. I must admit, it was kind of nice having my own little single serving cake. 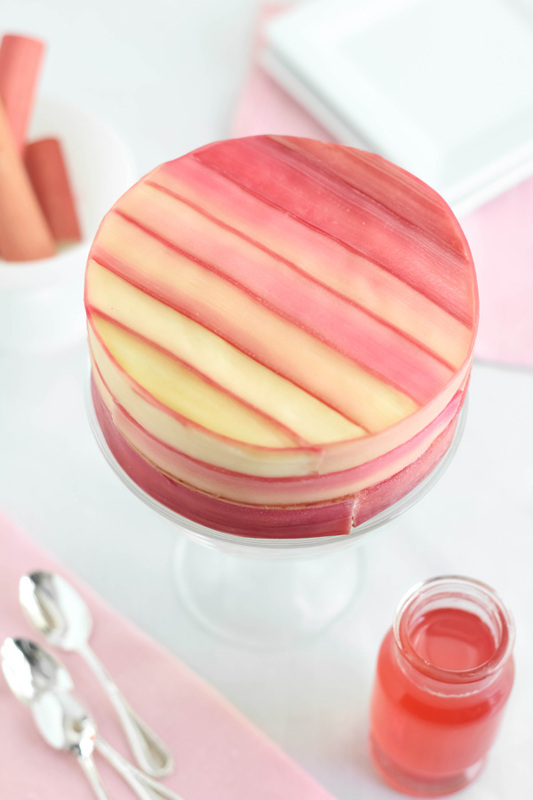 The most complicated part of building this cake is the process of boiling the rhubarb strips in sugar syrup.You can't leave them in the boiling water for too long or they'll become rhubarb noodles. I found that a cooking time between 20 and 30 seconds was about right. It's a good idea to have extra rhubarb strips in case the first batch ends up being practice. Decorating the mousse cake was so much fun, and it was easy! Just lay the strips across the top of a frozen mousse cake and trim the excess with a pair of kitchen scissors. 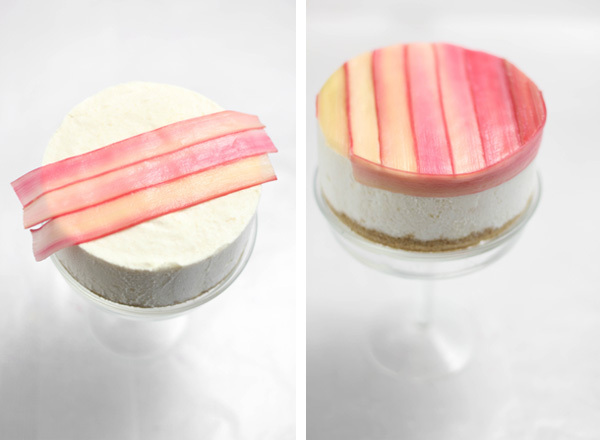 The rhubarb pieces I used were varied in color, so I decided to create an ombre effect. After you're done with the top, start layering the strips around the edges. Layer the first pieces so that the rhubarb strips are flush with the top of the cake and hides any ragged edges you may have created while trimming the top. This mousse cake is like a gift all wrapped in beautiful packaging with delicious things inside. The center is so sweet and mild with light pineapple flavor, it really strikes a balance with the slightly tart rhubarb covering. I'll definitely be making it again before fresh rhubarb disappears from the market shelves! Combine the ingredients in a large bowl. Mix well, making sure that all the crumbs are well coated with butter. Press evenly into the bottom of an unlined 8 or 9 inch springform pan. If making individual cakes, place 6 pastry rings on individual sheets of plastic wrap. Divide the crust mixture evenly among them and press tight with a flat-bottomed tumbler. In a small bowl, sprinkle the powdered gelatin over the pineapple juice. Let stand until the gelatin absorbs the water. Microwave for 10 seconds at full power or until the gelatin has melted into a clear liquid. Gelatin can also e melted in a saucepan on the stovetop over medium heat. Combine the fruit puree and sugar; mix well. Pour in the liquid gelatin mixture. Let stand at room temperature until the mixture begins to thicken, about 20 minutes. Whip the heavy cream until stiff peaks form. Stir the fruit puree mixture gently to loosen it. With a large rubber spatula, fold 2-3 tablespoons of whipped cream into the fruit puree to relax it. Fold in the remaining cream until blended and there are no longer steaks of fruit visible. Pour the mixture over the crust in the spring form pan (or divide between pastry rings) and freeze until solid, about 2 hours. Place the water and sugar in a small saucepan. Bring to a boil over medium-high heat and stir until the sugar is dissolved. Lower the heat to medium and let stand until the mixture is at a slow simmer. Lay out sheets of double thick paper towels on a large work surface or your kitchen counter. With a vegetable peeler (Y-shaped or asparagus peeler-type) shave the rhubarb stalks into paper thin strips. Place two to three strips in the simmering water at a time, only allowing them to cook for 20-30 seconds. Lay the cooked rhubarb strips flat on the paper towels to drain. Repeat with remaining rhubarb strips. After you're done, the sugar syrup will be bright pink-red. Reserve the syrup for later use. To decorate the cake, lay the strips on the top of the cake until the surface is completely covered. 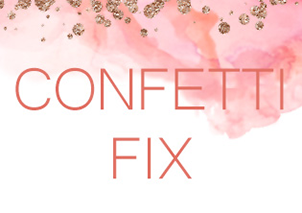 Trim away the excess with kitchen scissors. The strips should stick naturally, but if they do not, brush them with a little of the reserved sugar syrup. Wrap more stalks around the sides of the cake, beginning with the top so that the strips will cover any ragged edges created during trimming the top. Brush the entire cake with the reserved syrup. Place in the refrigerator to thaw. Cut with a very sharp knife - rhubarb can be very fibrous, so this is a very important step. You may also cut the cake into pieces while frozen and let the slices come to room temperature. Store the cake, covered, in the refrigerator or freezer. Beautiful! I love how you decorated it. A genius idea. This cake is the most beautiful cake in all the land! 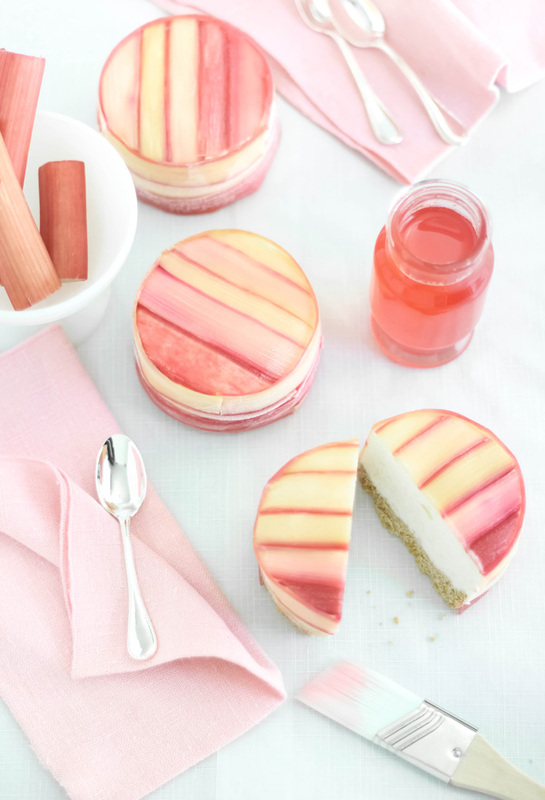 I am so obsessed with those rhubarb strips! Hands down the prettiest cake I've ever seen! This is just so so beautiful!! How do you do it? How is everything you create so beyond gorgeous that it is able to shock and awe-inspire each and every time?! Another beautiful---and unbelievably tasty-looking---creation, Heather! No. WAY. Seriously. My chin dropped. WHA? How...INSPIRED. You blow my little mind. GORGE to look at, can't imagine how yummy those sweet tart flavors would be! You are amazeballs with awesomesauce. Wow this is SO stunning! I wish I could make something this gorgeous! That cake is looking absolutely gorgeous! I love the colors and it's so classy! You are a dessert fiend genius and I do care who knows it, because everyone who doesn't should. This is absolutely gorgeous, Heather. So glad you could share this with us--if only I could order this from you! You never cease to amaze me Heather! You're artistic ability is so inspiring. Nothing you do is ever dull! 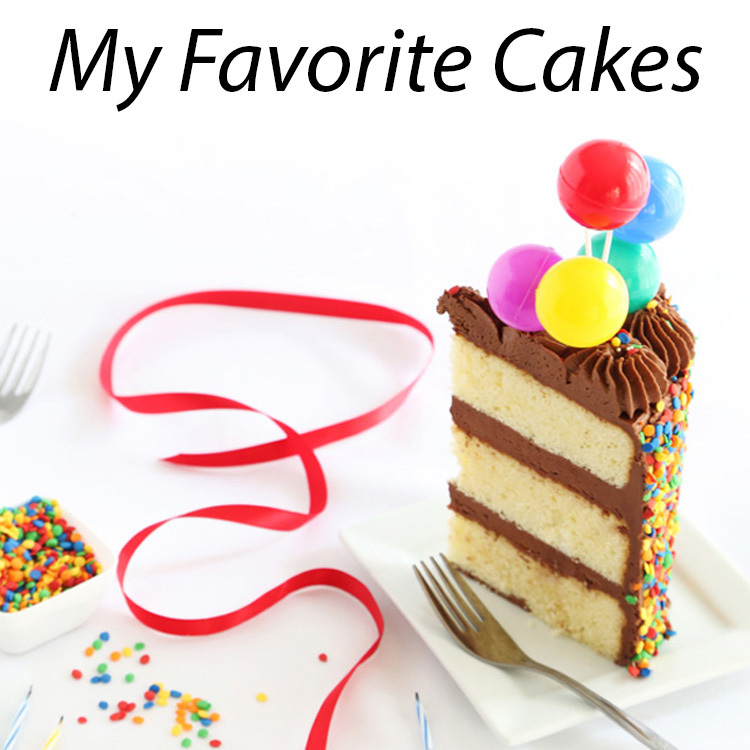 Love your blog, and LOVE this cake! Heather, everything you do is beautiful. I didn't realize these are strips of fresh rhubarb. Placing them is not as easy as it appears. You really are skilled. Amazing cake! Did you purchase the pineapple juice with pulp or make it yourself? Also with the pineapple puree, did you just puree fresh pineapple? Thank you for sharing!!! this is so much more than a cake - it's a work of art! This cake is absolutely gorgeous! I am always so blown away by your cakes Heather - absolutely gorgeous! This cake is so striking and beautiful! The flavor sounds incredible, and I never would have thought it possible to use rhubarb in this way. Your styling and photography are just gorgeous. This is amazing! What a beautiful creation! Wow! It looks so great! The decoration is amazing! Wow that looks stunning, I am so impressed! I love rhubarb, but never thought it could be so pretty! Holy smokes, girl!! You totally just blew my mind with this! LOVE! I first looked at this post, and thought, "Dreamy", and then saw that you described this cake the same way:) You met the challenge, that's for sure! Dreamy is right! cute cake, i will try at home.. Stunning! 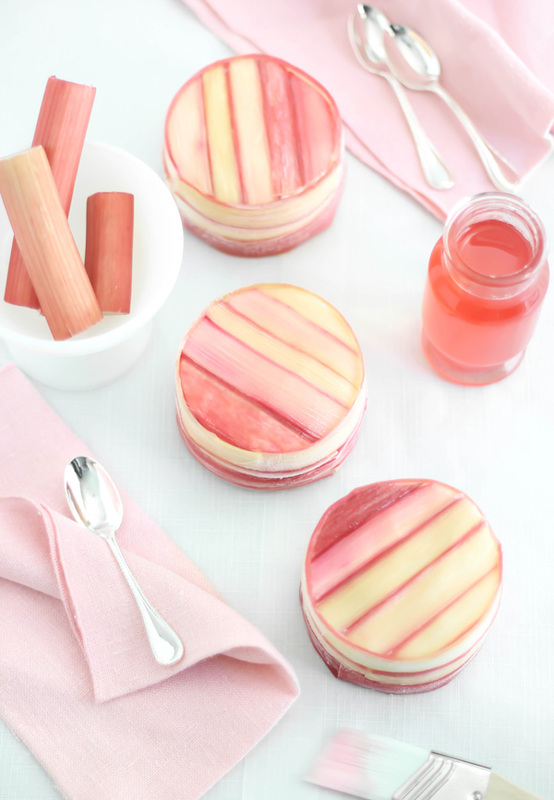 I love love love those rhubarb strips for decoration! Such a cute idea! I showed it to my mom and she loved it! Absolutely stunning! 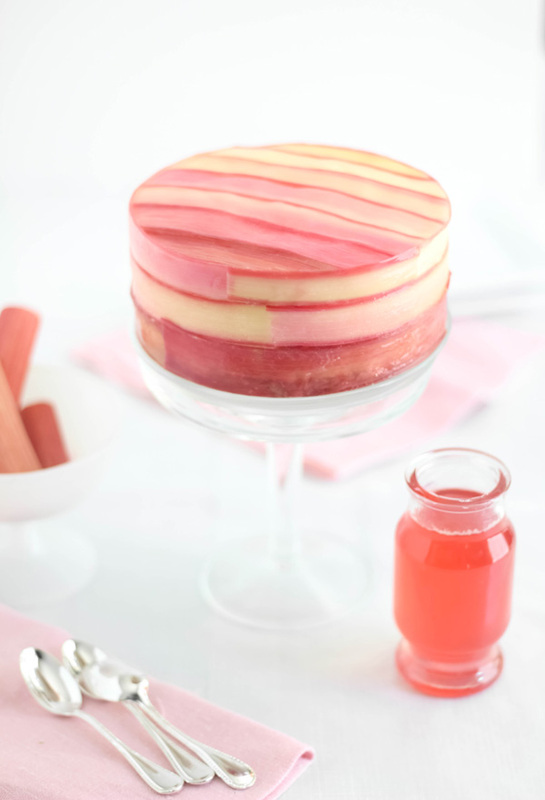 I love rhubarb in all it's forms (especially rhubarb curd) but this cake really showcases it beautifully! I would also really appreciate the recipe in it's original metric form if possible. I'm based in the UK and although working in cups is ok, I find the metric system more helpful where precision is required, such as in baking and patisserie. Hi Heather!! Do you think you could replace the pineapple with another fruit? If so, what would you suggest? Something like passionfruit? Thanks so much and the cake looks STUNNING!! For those seeking metric, I will scan the original recipe soon and link it in the post. 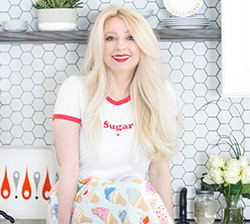 Hey heather, great recipe! But I know that gelatin reacts poorly with the enzymes in pineapple and won't set up unless it's cooked. Did you cook this pinapple? Or did you just buy canned? Thanks! I do have gelatin sheets. What amount would be equal for your recipe? I tried to make this cake twice but failed. I didn't understand as this is a very basic recipe. I'm from the Netherlands so not all ingrediënts are available so I used fresh pineapple which I blended to purree. After the second failure, I started googling and found that you can NOT use gelatine and fresh pineapple, mango, guave or kiwi. Due to the sourness and enzymes in this fresh fruits, the gelatine will lose it's binding. You can use canned pineapple or other fruits. Or you can cook the pineapple first so the enzymes start to break down. I now used canned mango, as no pineapple in my storage cabinet and this worked fine. I also had to swop the graham crackers for Maria kaakjes or lange vingers (dutch cookies) as we do not have graham crackers here. But all this does off course not change the fact that it is a very beautyful cake! Any chance for the german recipe? I am german and it probably would be easier for me. Just the reference would be fine. incredible! what a work of art! Yeah major heads up about the pineapple and gelatin! COOK THE PINEAPPLE FIRST. The enzymes will be your downfall.